During Josiah Henson's life, this house was his place of residence from 1841 until he passed away in 1883 and has now been declared as a National Historic Site. In the 1940's the Josiah Henson house was opened as a museum and in 1964 it was moved to its current location in Dresden, Ontario. In 1993 and 1994, the house was restored to take on the same look as it would have had in the 1850's. Josiah Henson, (Onkel Toms Hutte) Henson House, Dresden, Ontario, Canada, North America. 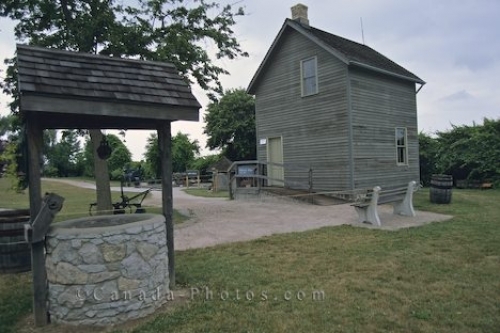 Picture of the house of Josiah Henson and the well that his family used in the town of Dresden, Ontario.